The Division of Dentistry and Orthodontics is aligned with the acclaimed USC School of Dentistry to provide routine and specialized dental and orthodontic care for more than 3,500 children and adolescents annually, including those with complicated conditions such as cancer and hemophilia, cleft lip and palate and other congenital disorders. Our expert staff encompasses board-certified and board-eligible dentists, orthodontists and oral surgeons who also have specialized training in pediatrics. Routine care includes oral examinations, full-mouth x-rays, fluoride treatments, general dental restorations (fillings, crowns, tooth restoration), ultrasonic cleaning and gingivectomy and laser treatment for gum disease. Children with complex and critical medical conditions often need dental care provided under general anesthesia. Our division integrates its care with the Division of Anesthesiology to be able to provide the highest quality dental care for children with special health needs. Our teams work with patients to intercept malocclusions early in a child's development to improve tooth positioning and minimize the need for future, extensive orthodontic treatment. Our team works in concert with our Division of Plastic and Maxillofacial Surgery to provide orthodontic care for children who are receiving treatment for cleft lip and palate. Our program incorporates an accredited Craniofacial Orthodontics Fellowship. In collaboration with the Division of Plastic and Maxillofacial Surgery, our division works to provide care for children who need jaw and mouth surgery. Our nasoalveolar molding program uses tissue and cartilage expansion to smooth the process of cleft lip and palate repair. 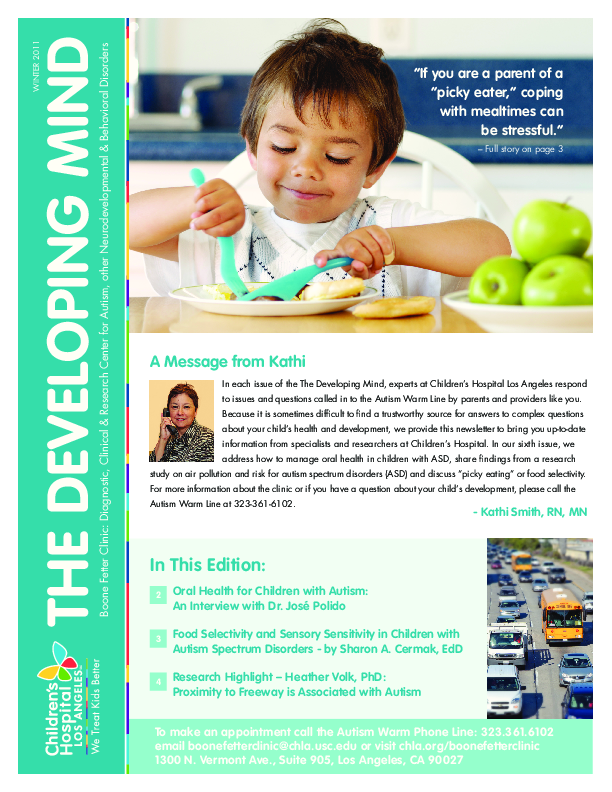 See page 2 for an interview with Dr. Polido on oral health and autism. See page 6 for a story on how the Division of Dentistry is an integral part of providing complex and, in some cases, life-saving care.